Every week I get to ask Jonathan David Faulkner 5 questions, some of them come from you, others come from me. This week, we decided to spoof this series. Unlike most weeks, Jonathan has not seen these questions, they are a bit off-the-wall (my doing) and I have challenged him to answer with a serious response. The result, could be hilarious. Q. 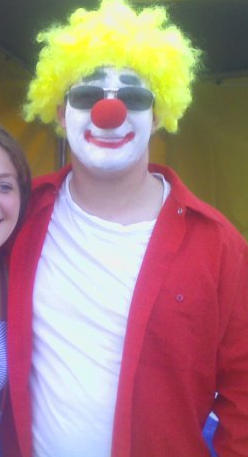 So Jonathan, Photo evidence recently surfaced (See below) on Facebook of you dressed as a clown. Now that your sorted past as a clown has been revealed, how do you think it will affect your positon here at God’s Heart? A. Yes Bradly, I served as a Clown for Christ at Albany Baptist Church for three years. I played a clown named Denim Jeams and started with what is known as The Hobo. After a clown who never smiled, which I could not do, because I smiled a lot. Then I switched to a White Face, which is the picture I believe you are referring to. I painted faces, participated in parades, attempted to juggle scarves and even went on a Clown Show called The Buffo Show where I participated in a fire juggling act. I think all the video footage of that was destroyed. I think. Q. We recently learned you will be taking some trips this summer to see friends new and old and…um…someone else. Is this not in fact a cover for the fact that you have joined a small circus and will be traveling to meet up with them? A. No, I only feel I have joined a circus, with all the crazy stuff that is going on in this world right now on both sides of the political spectrum, all we need is a big top. I am taking some trips this summer though, and I look forward to them and to the people I am going to get to see, some of them for the first time. Q. Back to Facebook photos: One appeared recently of you with no beard. Are you now concerned that people will take your theology less seriously now that you have lost your beard? A. I think people will take me less seriously after this article comes out. Q. Do you think God’s Heart for Those needs a private Jet? A. I think that I would not know what to do with a Private Jet, nor am I interested in trying to biblically justify owning one. The amount of Eisegesis that must take would be incredible. Q. With the end of the semester looming, how much are you looking forward to your first summer with sharks nearby? A. I have never been to the ocean in the summer, I have lived in Kansas for six years and despite what Chris Meyers (Fox Sports Analyst) tries to tell us there is no ocean property there. I…hadn’t thought about the sharks though. Have a Question for Jonathan? Bradly Taylor is the Content Editor for God’s Heart.